Cooking and food preparation doesn't have to be complicated, but you need to make sure you're following these 5 food safety rules in the kitchen as you do it. That's because keeping your family both well fed and safe are some of the most important things you do each day. Rule 1: Wash hands between steps. Washing your hands before cooking is almost a no brainer, but many forget to also wash between steps. This is especially true that you should wash your hands after handling raw meat. You also should wash your hands after touching any other surfaces. 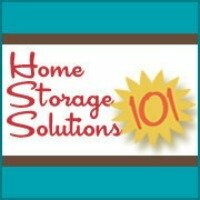 Little things like running out to the garage to grab something out of the deep freeze expose your hands to germs on light switches, doorknobs and handles. Before handling any food again you need to once again wash your hands. Rule 2: Sanitize work surfaces. When preparing meals make sure that your counters, cutting boards and all work surfaces have been sufficiently sanitized first. You can use this homemade bleach solution to sanitize your counter tops before you begin your preparation of meats, vegetables and fruits that will be used in your meal preparation. In addition, here are instructions for how to sanitize your cutting board. Rule 3: Use separate cutting boards for raw meats, vegetables and produce, and cooked foods. It may seem like a hassle to have multiple cutting boards in your kitchen, but this is one of the food safety rules in the kitchen I always stand behind. Designate one board for raw meats, one for fruits and vegetables and one to cut cooked or prepared food on. This keeps cross contamination to a minimum, and will result in safe and healthy food preparation in your kitchen. Rule 4: Cook foods to safe temperatures. Check out the recommended temperature for food safety and make sure that you are cooking foods to safe temperatures. This varies between different cuts and types of meat, but here's a great resource from my friend Marybeth where she's listed the types of meat and what temperature they should be cooked to (and it includes an infographic!). And while you may think you can tell, just by sight, when something is cooked enough I strongly urge you to use a meat thermometer to actually check the internal temperature. Marybeth also wrote an interesting article showing a comparison of the internal temperature of chicken as shown by a meat thermometer versus what it visually looked like when you cut into it (click the link for the article). While really raw chicken was pretty obvious visually, I would have been tricked into thinking some of the pieces of chicken were done if I only used my eyes to test doneness. 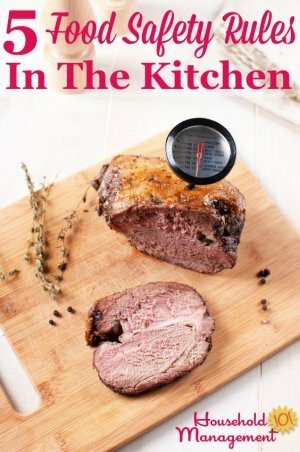 Finally, Marybeth has also written this article explaining exactly how to use a meat thermometer, so you make sure you're doing it properly. Rule 5: Keep hot foods hot and cold foods cold. For those times when you will be hosting a dinner party, buffet or otherwise leaving food out to be served over the course of a few hours it is important to keep food at correct temperatures. Hot foods should be kept at 140 degrees or higher and cold foods at 40 degrees or lower. Utilizing a crockpot or other warming tray is a great way to keep food hot. Bowls with ice are also great method of keeping those cold items cold. Just make sure you check routinely to make sure you aren't allowing foods to go below or above temperature. These food safety rules in the kitchen are simple steps to keep you and your family safe from the frustration of a food borne illness. Keeping things clean and at the proper temperature will keep you and you family enjoying delicious meals without any fear. This article is sponsored by the Indiana's Family of Farmers. All thoughts and opinions are my own.